It's mid-September and I'm 80,000ish words in Merakoran Agenda. It's fun writing because, at a certain point, the story catches hold of me and starts to write itself. Like a runner's high, this is my writer's high. Something about how my brain works requires that most of my 1st draft gets junked as I write to find the story waiting and wanting to be told. Against this, I commissioned art for the River of Time mentioned so much in my writing. While there is a ton of great art work out there featuring clocks and skeletons, I wanted something within the Forsaken Isles. Dar Tania 2: Set's Dream ends with 9 year old Ana sitting on Dar Tania's lap while speaking to the priestesses. The art will feature this as a past scene with 20-year old Ana looking back and seeing it, while looking forward and seeing herself as she hits the peak of her powers. The River is a key concept in my writing as it is the metaphor by which Morbatten understands how Time flows. Because of their influence, surrounding nations adopt the metaphor as well. Clerics and paladins in the Forsaken Isles are able to access the River and use it side-step in Time. It looks they vanish and reappear in a blink. Though all of my books have River scenes in them, I am hoping that having a visual will help drive home what it is like. The Multiverse map also shows how the River is actually the flow of Time. Ancient civilizations named it the Ethereal, or Ether for short. But, Tiamat sees it for what it is... poisonous murder to the eldar, and a tool for mortal Tehrans to grow in power. The art should be done sometime in early November and shortly after that I'll start work on the cover art for Merakoran Agenda! Ending of summer is a rough time for me. A lot of unpleasant things have occurred in my life going in September. This year I'm focusing on writing. It distracts but also gives me something to look forward to. Merakoran Agendas is coming along nicely. Though I cannot say when this book might be ready (I'm targeting end of the year best case, early Feb worst case), I'm 52k words into it and I can see the framework of a really great story coming together. After all, someone has to tell the story of Tanians who are not priestesses, dragons, or mages! Click the screenshot or this link here to view the full interview. I've really enjoyed getting to know Michael DeAngelo and the Tellest books. Though YA is not my personal thing, my daughters have enjoyed his Mageborn and Dragonspeaker books a lot. While this Weebly domain will remain active indefinitely, I'll be quietly working to convert all content over to FORSAKENISLES.COM for a consistent web experience with the content of my writing and the worlds they empower. I'm also hard at work on the next book, which for now I've titled "Merakoran Agenda." This story picks up with Ash and Khalla following the story told in Bomoki's Gate. They're trying to put together a team to go back to Merakor. Behind the scenes, the Thieves Guilds of all the Isles' nations are vying for power and control over the black market material flooding them from Bloodstone. I'm 40,000 words into it and it seems likely that Ash and Khalla's relationship might not survive... or at least, Ash's secrets won't. I'm having fun with a Rogue Guild in Taysor headed by a new character named Grant. Grant and his team don't want to be bound by the rules of the other guilds and so do their own thing. They're compelling to write. Stay tuned in the coming weeks for more updates. There will be a promotional discount from 8/2 until 8/12. It's almost time: Are you Ready? Syliri and Bruce are coming soon. There's a checklist of things to ensure are done before publishing. Compared to writing the actual story, that checklist is miserable. But, it's worth getting done. The closer I get, the more I can't wait to share this tale with you all. August 2nd. 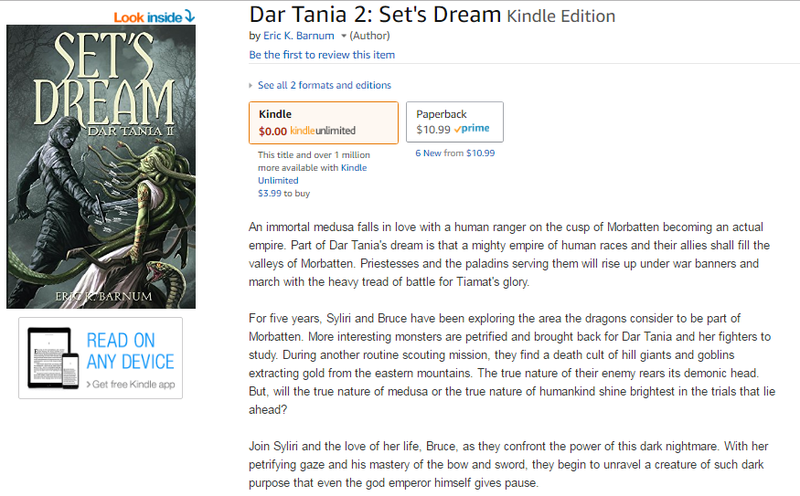 Dar Tania 2: Set's Dream will have a promotional price of $0.99 as an eBook until mid-August. If I could control paperback pricing, I would discount that as well. 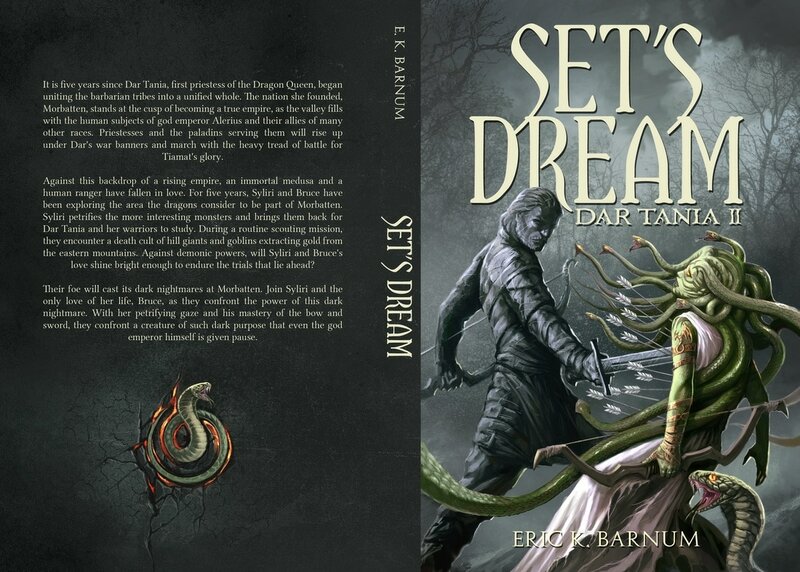 I'm working through final proof of Dar Tania 2: Set's Dream, or what I have been naming "Syliri & Bruce." For reasons I cannot explain right now, not because I can't list them off but because the hold this story has on me won't let go, I am crazy excited about it. I always wanted to tell stories around some of the epic and tragic characters in the Forsaken Isles, while also continuing my arc of powerful female protagonists. Syliri fit the bill and this story became personal and deeply fulfilling to write. I'm not going to say something corny, like "I'm Syliri." But, I will say that Syliri's isolation and aspirational dreams of being not the way she is, it touched me. Slaadi are an alien race that dwells in the untended clutter of the Abyss. Able to make themselves look like anything they want (they're shapeshifters), they usually masquerade as whatever race they're dwelling with. Morbatten, through the writings of Sage Alaura, recognizes levels of Slaadi as per the power ranking of dragons by color. That is, Green, Blue, Red, Gray, Black. Gray and black are distinctions the Slaadi themselves use and so Tania adopted that after Red. The rest of this posting is about how Slaadi society works. At Azuros +, Slaadi reproduce by creating transformant worms. Acting like parasites, these take control of a targeted host. Each worm contains a pearl of sentience from its maker. This enmeshes with the host giving the Slaad total access to their memories. Slaadi prepare targeted hosts by inscribing an Abyssal rune on their right shoulder. It looks like a spiral set of scars. Because this continues the time thread of Dar Tania's life and features many familiar and new characters from that story. Though I have mentally thought of this as "Syliri & Bruce" for years, I have to admit that reading Christopher Tolkein's "Beren and Luthien" made me consider a less romantic title. Syliri & Bruce - Getting So close, So good! Over the weekend, I had a good review of book cover art with the illustrator. I'm so excited for this next project. My test readers/editors are starting to kick me feedback and everything is coming together for an early August release! I do not know this author, but think Ylgolth might look like this. ​So, let's talk bad guys - the Slaadi. Syliri & Bruce - August 2017! I have no idea who this artist is, but Syliri would love to see herself like this. Syliri & Bruce picks up 5 years after Dar Tania. On Dar's orders, the medusa Syliri and ranger Bruce (they met and had a thing in Dar Tania) begin exploring the territory considered by the dragons to be part of Morbatten. Tellest.com is the world/game/books by author and creator Michael DeAngelo. They're fun. I was lucky to have him pick up and review Dar. The picture is clickable and will take you to his full promo. It's fun to see these things out there, to connect with other writers, and also with you, the readers. My current project, Syliri & Bruce, is nearing completion of a first draft. I find myself thinking that the next one feature the characters strongly noted in reviews and emails. Hit me up with your thoughts. ​May the dragons watch over you.